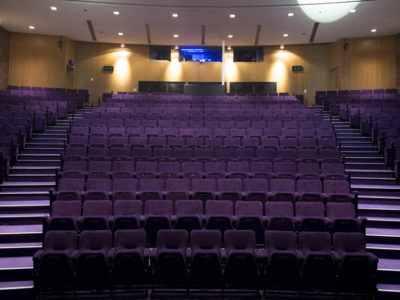 With over 2.3 million higher education students in the UK, university lecture theatres are very important spaces where the next generation of the country’s workforce and future leaders are being educated. According to Barbour ABI’s Economic & Construction Market Review, in 2018 to date education projects accounted for a monthly average of 8% of construction in the UK. Its latest quarterly analysis of education construction shows total education contract awards in the three months to September 2018 at a value of £1.5 billion whilst data for September 2018 indicates that colleges and universities again accounted for the largest share of education contract awards at 49%. 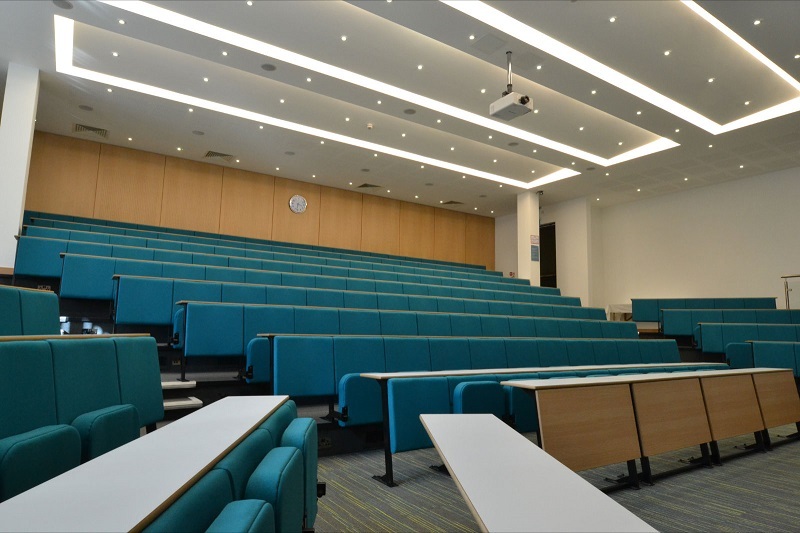 With so many new university buildings being constructed throughout the UK plus the ongoing refurbishment and upgrade of existing campuses, it’s important these facilities and their fixtures and fittings are designed to enrich the learning experience for students. If students are to be effective learners it’s essential they are engaged throughout a lecture. To help facilitate this they must be comfortable, have sufficient workspace and personal space, and be able to clearly see and hear the content being presented to them. 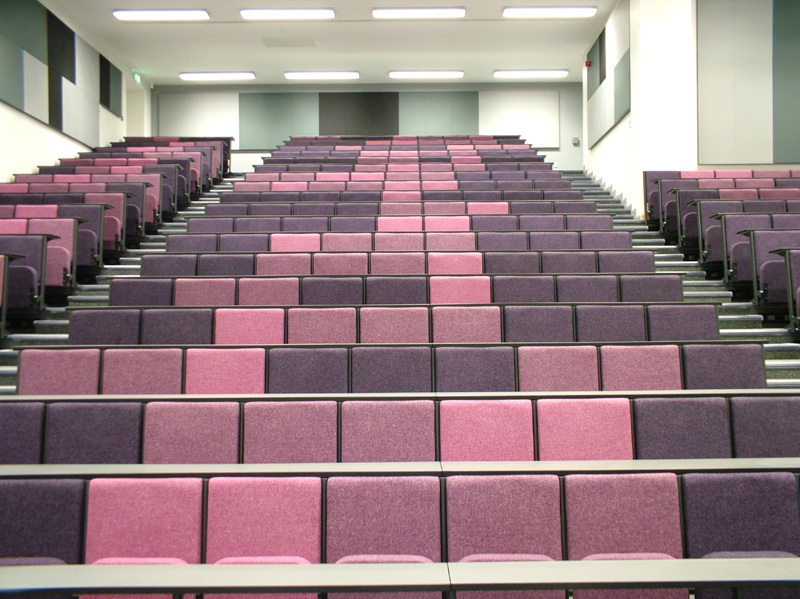 Here we take a look at the key points to consider when specifying seating and how the lecture chairs you choose can help enhance learning. 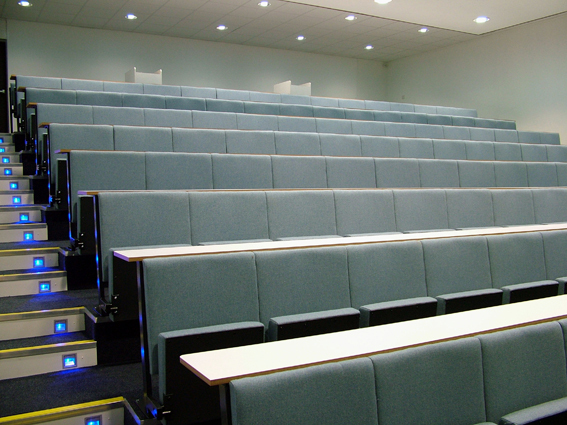 Most large lecture theatres are designed in an auditorium style with tiered seating but this format also works well in smaller spaces. 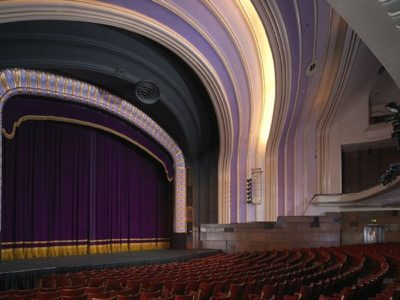 A tiered floor helps improve sightlines for all students whether they are on the front or back row, ensuring they can see what’s being presented to them without having to peer around the back of heads on the row in front. There are a number of layout options for a tiered floor which can be designed in straight, angled or curved rows. 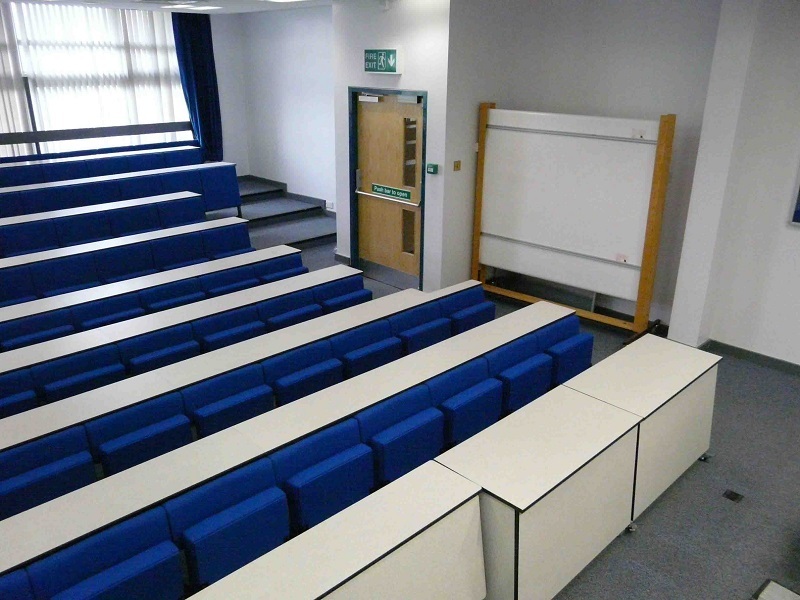 Straight rows can usually accommodate more seats whilst curved or angled rows are better where collaboration or discussion between students and the lecturer is required. 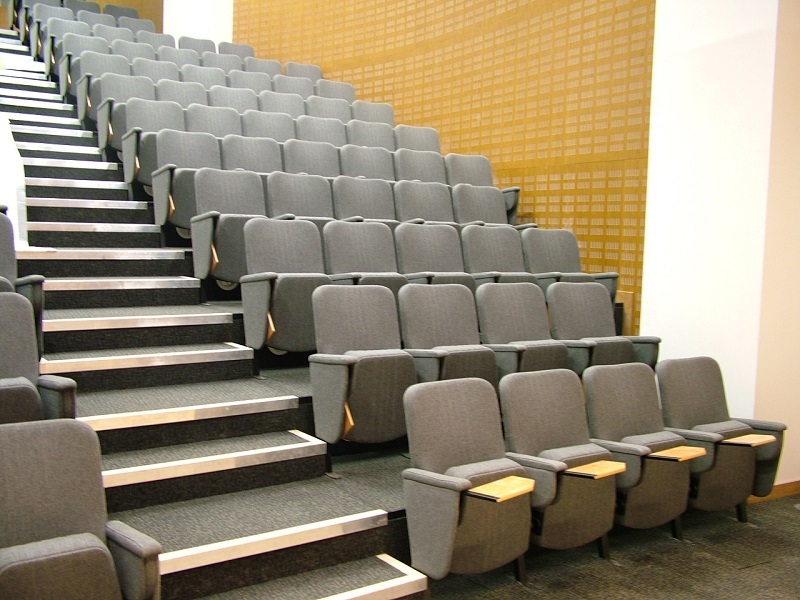 Many seating suppliers can also manufacture and install a tiered floor which will be bespoke made to fit the lecture theatre. Discomfort can be a big distraction causing students to shuffle around, losing focus on the lecture and also distracting others around them. 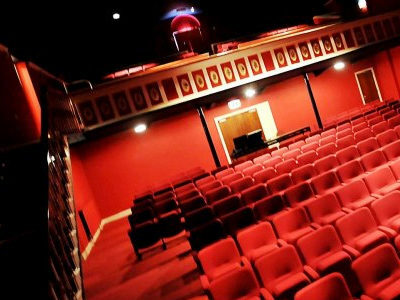 If seats are comfortable students can focus on what is being taught with no thought about the seats they are sat on. 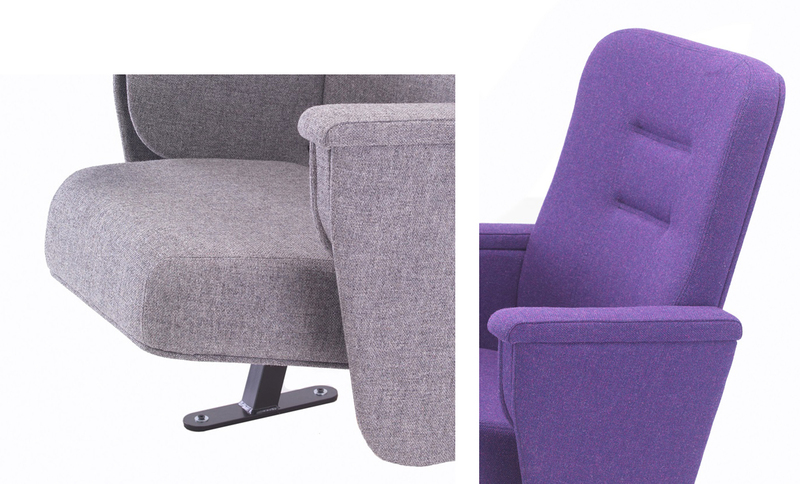 When specifying lecture chairs don’t just go off looks alone. 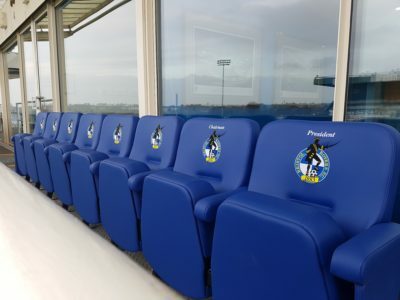 Find out the specifications from potential suppliers so you can compare different seats and request samples to try out. Most suppliers will be willing to provide a sample chair but bear in mind that sitting on a seat for a few minutes is very different to sitting on it for several hours. 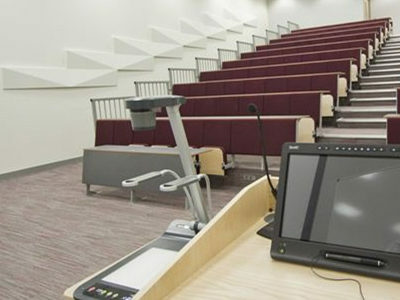 Lecture theatres generally have either rows of fixed desks or individual writing tablets integral to the chairs. The most appropriate option should be dictated by the subjects to be taught in the room and how much equipment students might need to use. Fixed desks offer the most workspace and are also better where students need to work together or share reading material or devices. Individual writing tablets are good for note taking and can be folded out of the way when not required. 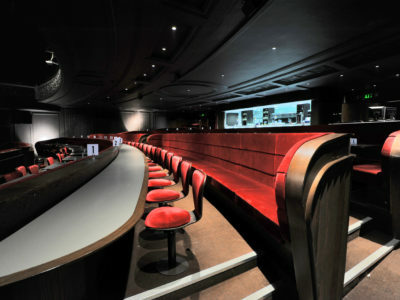 This is ideal in venues where lecture theatres are multi-purpose or hired out to other organisations who may use the facilities for other types of presentation where desks are not needed. 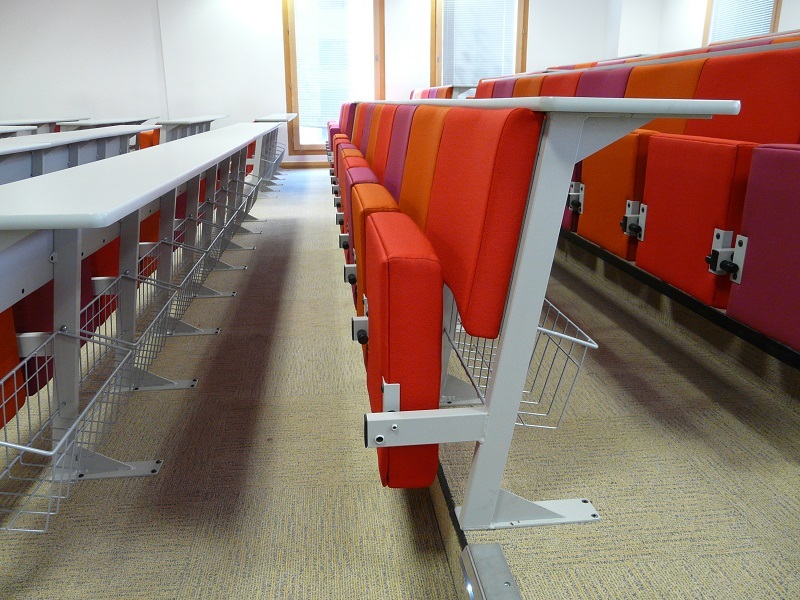 Personal space is also something to think about with the basic need to ensure seats offer sufficient space for all users and that students have freedom of movement without feeling enclosed in their seat. Students will also be carrying bags and coats and they need somewhere to put these during lectures. Bags can usually be stored under seats but there are other options such as storage baskets which you may wish to consider. Another important consideration is access for wheelchair users. 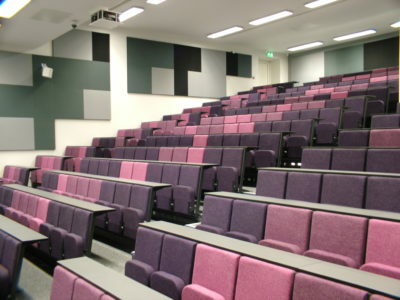 There are various options including removable banks of seats and desks which can be moved out of the way as and when required or the lecture theatre can have a permanent space to accommodate wheelchairs. 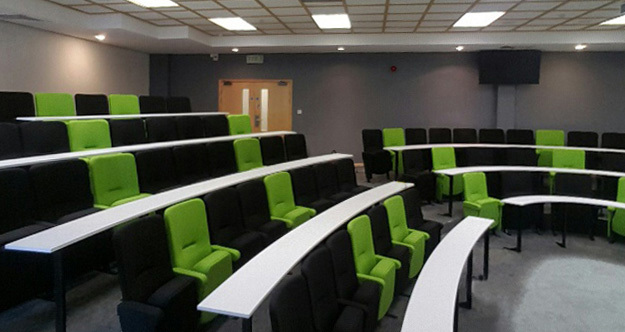 Once you’re satisfied that you're preferred seats are the best option you can work with your supplier to have them tailored to fit the space and to create the desired look and feel in the lecture theatre. 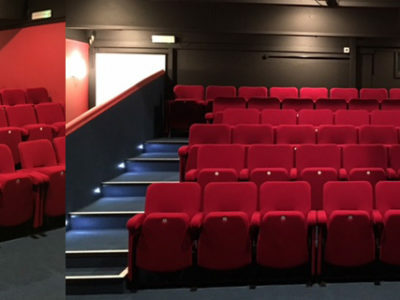 The choice of fabric colour has a big influence on the ambience created so it’s a good idea to look at images of existing installations in similar colours or ask the seating supplier to provide a mock-up image of the specified chair in the desired colours. In general darker colours help create a more professional, business-like ambience, muted tones are calming whilst bright colours are energising. 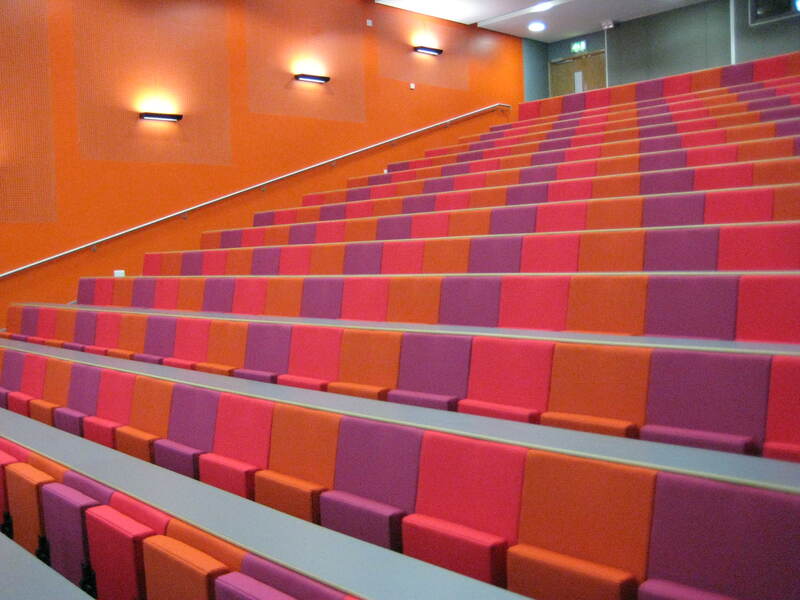 Using a range of complimentary or clashing colours is also a good way to create interest in a lecture theatre and brighten things up. 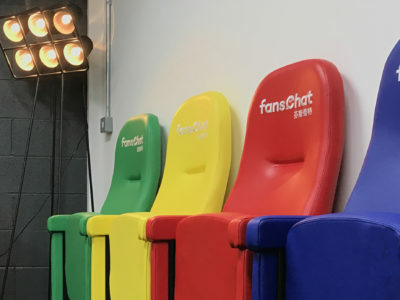 When specifying seating it may be the design and style of a chair that creates initial appeal but to truly ensure it’s the right chair to enhance learning it’s essential you consider each of the aforementioned points. 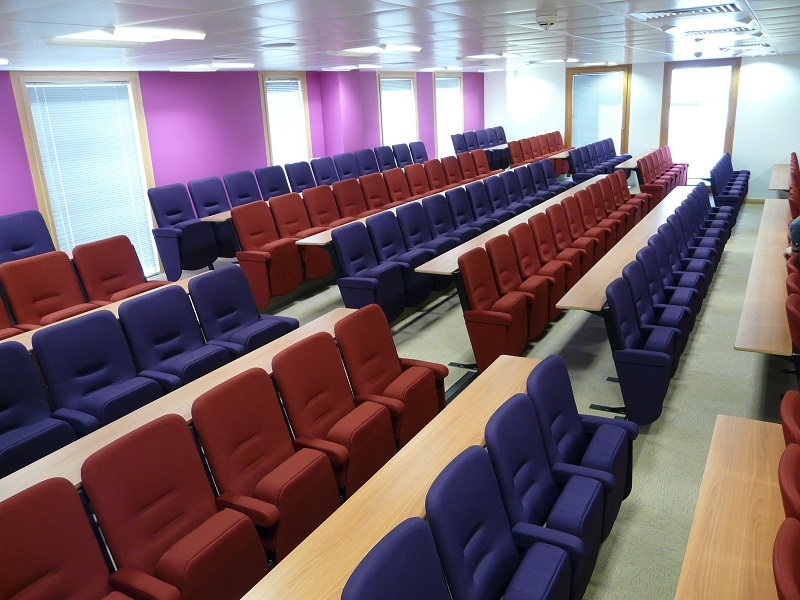 To make an enquiry about Evertaut lecture chairs, please complete and submit the short form below.